The OPT3001 is a single-chip lux meter, measuring the intensity of light as visible by the human eye. The precision spectral response and strong IR rejection of the device enables the OPT3001 to accurately meter the intensity of light as seen by the human eye regardless of light source. The strong IR rejection also aids in maintaining high accuracy when industrial design calls for mounting the sensor under dark glass for aesthetics. The OPT3001 is designed for systems that create light-based experiences for humans, and an ideal preferred replacement for photodiodes, photoresistors, or other ambient light sensors with less human eye matching and IR rejection. The digital operation is flexible for system integration. Measurements can be either continuous or single-shot. The control and interrupt system features autonomous operation, allowing the processor to sleep while the sensor searches for appropriate wake-up events to report via the interrupt pin. 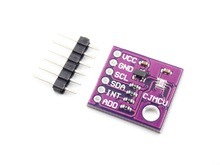 The digital output is reported over an I2C- and SMBus-compatible, two-wire serial interface.